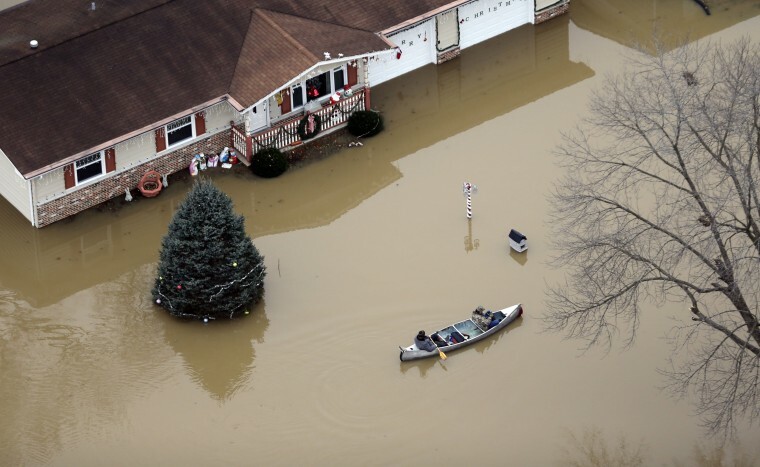 People use a canoe to navigate a flooded street on Dec. 31, 2015, in Arnold, Mo. Surging Midwestern rivers have forced hundreds of evacuations, threatened dozens of levees and brought transportation by car, boat or train to a virtual standstill in the St. Louis area. People watch as flames rip through the Address Downtown hotel, near the world's tallest tower, Burj Khalifa, in Dubai, on Dec. 31. People were gathering to watch New Year's Eve celebrations when the hotel caught on fire, with the cause of the blaze still unknown according to the emirate's police chief. 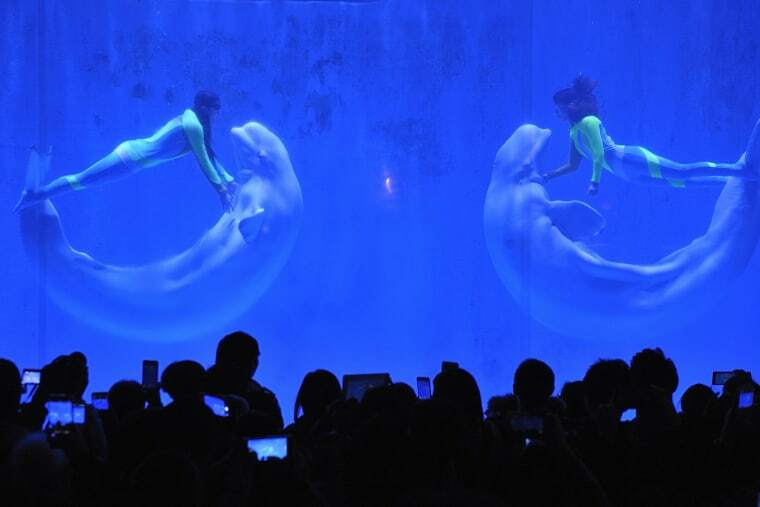 White whales and their trainers perform for visitors at Harbin Pole Aquarium in Harbin, China. The aquarium features the world's only polar whale underwater performance. 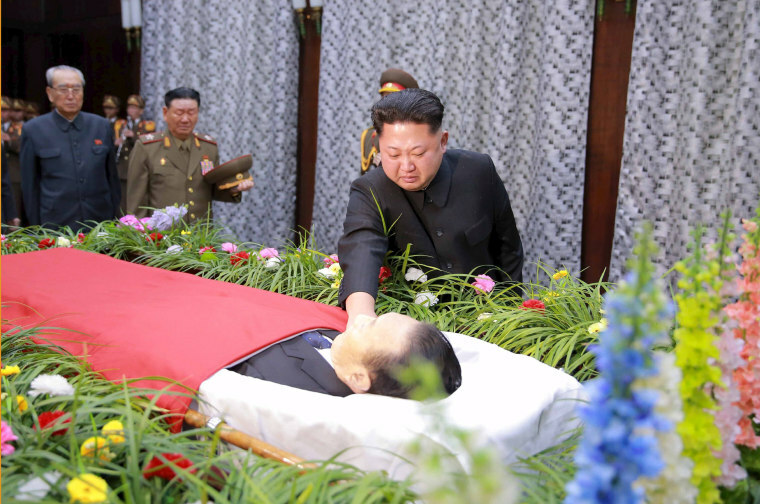 North Korean leader Kim Jong Un pays his last respects to Kim Yang Gon in a photo released by North Korea's Korean Central News Agency on Dec. 31. Kim Yang Gon, a senior North Korean official and a top aide to leader Kim Jong Un, died in a car accident, state news agency reported on Wednesday, the latest dramatic death or disappearance in the leader's close circle of deputies. 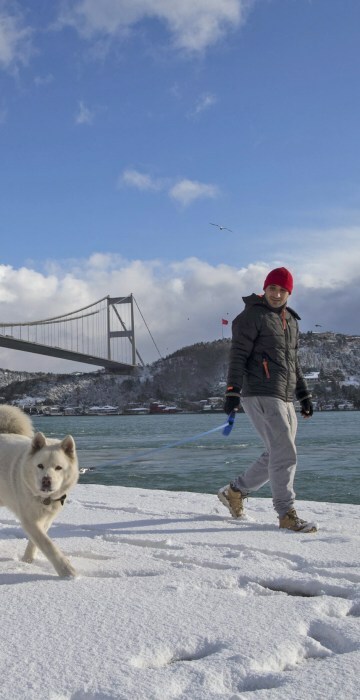 A man and his dog enjoy a snowy day on the Bosphorus near the Fatih Sultan Mehmet Bridge in Istanbul, Turkey, on Dec. 31. 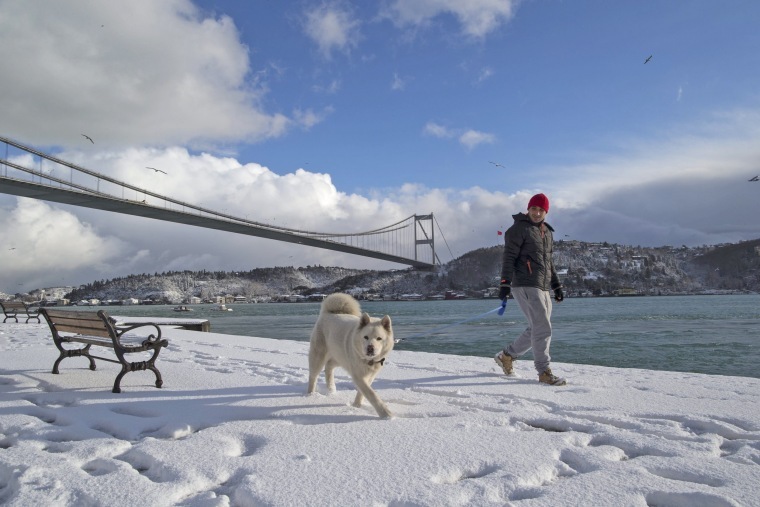 Hundreds of flights in and out of Turkey were canceled for Thursday and Friday at Istanbul's two airports after the city was blanketed by heavy snow, which also forced the closure of schools and brought chaos to the roads. 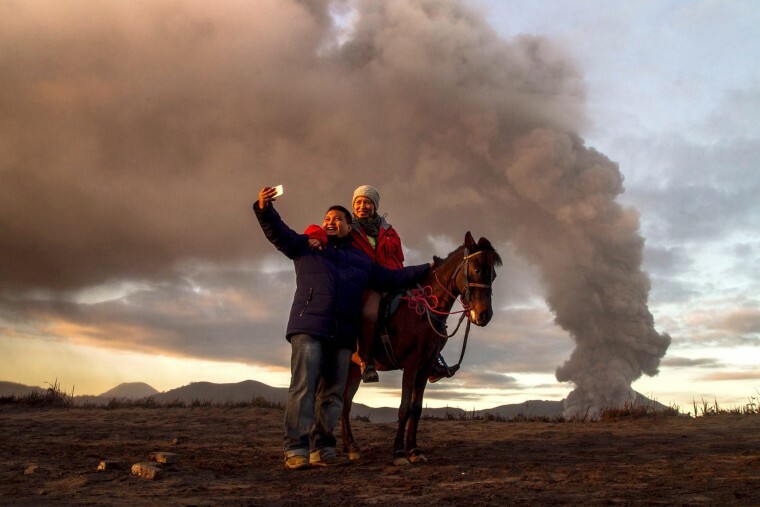 Tourists take a selfie as Mount Bromo spews ash during an eruption in East Java, Indonesia, Dec. 31. Indonesia's Mount Bromo is on the second highest alert level as its activity has increased in the last two months. Kaleo Woods is packed into a pen with other revelers while waiting for midnight in Times Square in New York on Dec. 31, 2015. Around 1 million people are expected to converge on Times Square for the annual New Year's Eve celebration. This year's festivities will also be attended by nearly 6,000 New York City police officers, including members of a specialized counterterrorism unit. 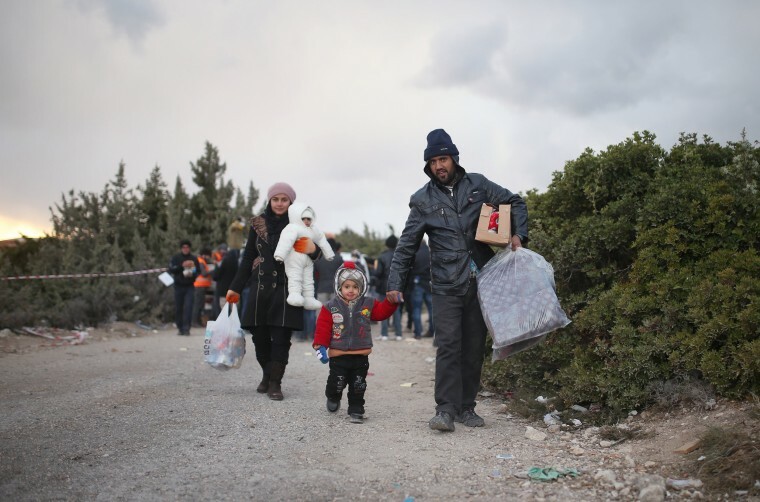 A migrant family walk after receiving free food as they wait to travel to Greek islands by dinghies, near Cesme, Izmir, Turkey, on Dec. 31. More than a million people hoping to escape war and poverty have made their way into Europe this year, according to migration monitors, but attention has been focused on two more common routes — across the Aegean Sea from Turkey to Greece or across the Mediterranean from Libya to Italy. 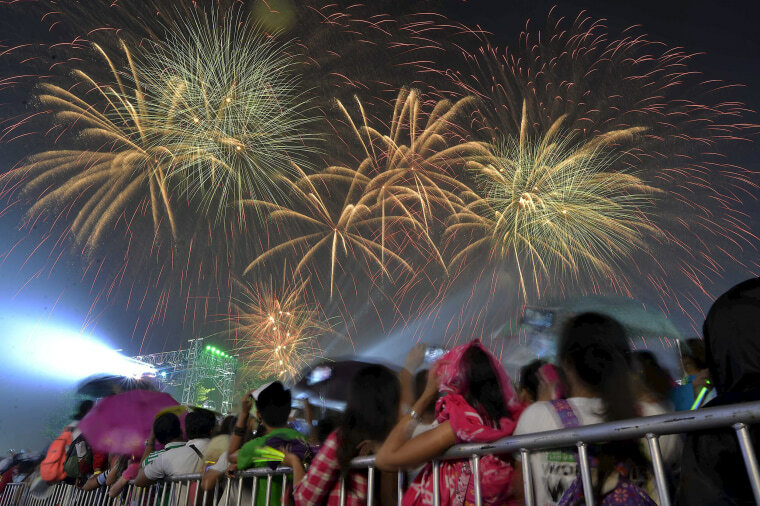 Revelers watch fireworks during New Year celebrations outside the Philippine Arena in Bocaue, north of Manila, on Jan. 1, 2016.